Barn on the Farm Festival! I am way more than excited for Barn on the Farm festival. And it's not just because I'll be close enough to Matt Corby to kidnap him (I promise). It's not just the music and snack fueled road trip me, my friends, and band will be taking to get there. But I will have the opportunity to see some of my favourite artists for the first time in a beautiful intimate setting... AND I'll be playing alongside them too!? Me and my acoustic band will be opening the intimate stage at 3:15pm on the Friday and I seriously can't wait! If you haven't been to Barn on the Farm Festival it basically is what it says. 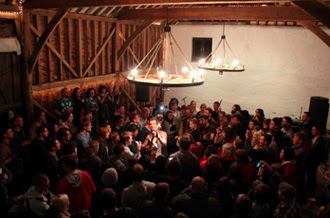 An annual folk and acoustic festival held on a converted Barn in the lovely land of Gloucestershire, featuring long list of lovely and unbelievably talented artists. Sadly this year it's sold out, but if you are going come over and say hi, bonjour, guten tag and any other forms of hello! I will be making a vlog of the weekend and the journey to get there before it, so look out for it!